Highly productive cutter heads with new clamp blocks allow movement of the blades axially for higher productivity and enhanced production stability. A system problem of stick blade cutters with rectangular blades is the clamping principle. Rectangular stick blades are pressed radially against the slot bottom of the cutter head body. Because the average cutting force is tangential to the slot bottom, the clearance between the slot sidewalls and the blade sides allows the cutting force to rock the blades. Figure 1 shows the seating principle of rectangular inside and outside blades . The Pentac® cutter system was developed in 1998 in order to eliminate the disadvantage of the existing stick blade cutter designs. 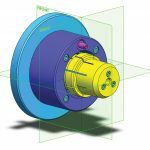 The goal of this development was to build a cutter head which provides a positive blade seating, rather than a friction seating like in most cutter systems that use rectangular blade sticks. Figure 2 shows to the left a three-dimensional drawing of a Pentac cutter body with slot bottoms, which are formed in the shape of prisms. This cutter system is called Pentac because of the pentagon shaped cross section of slots and blades. The slot webs will not contact the blade sticks but have only the function to hold the outer clamp ring (not shown in this drawing) in position. After applying torque to the clamp screws, even this function of the webs is no longer required. The outer clamp ring, clamp screws, blades and cutter body are now connected as one unit. Pentac cutters are very stiff and can be built slot after slot. Torquing the clamp screws in a particular scheme is not required. The design principle of Pentac cutters promotes the possibility of high precision grinding of the prismatic seating surfaces. This possibility is not given for cutters with integrated outer ring, which have to be manufactured using the wire EDM process. The first finished Pentac cutter head is shown to the right in Figure 2. The outer ring is connected to the cutter body applying a shrink fit. The figure shows a wider cutter body, which allows for longer clamp blocks and higher clamp forces than were possible in the past. Today, Pentac cutters are known for their positive blade seating and the easy axial movement of blades during truing which eliminates blade micro movements and allows more precise building vs. rectangular stick blades and conventional cutters. 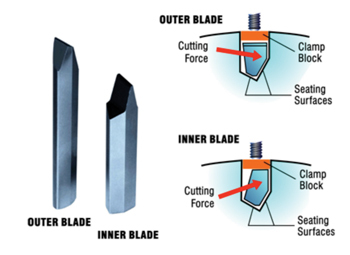 Those are important factors for cutting with carbide blades in order to avoid chipping of the cutting edges and to assure the equal distribution of the chip load to all blades. Figure 3 shows the Pentac seating principle of an inner and an outer blade. The angles of the seating surfaces towards the cutter body are 30° and 60° relative to the clamp block surface. The clamp force and the reaction component from the 30° and 60° surfaces keep the blades in position. The steeper 60° surface backs the blade up against the cutting force. 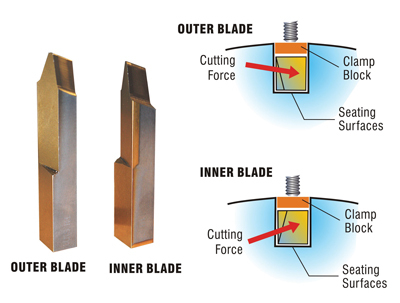 The cutting force presses the blades from the cutter front face against the 60° surface at the backside of the blades and tries to separate the blades from the 30° surface. The clamping reaction force on the 60° surface creates a friction force vector that points against the separation force and prevents separation. An interesting feature of the Pentac cutter system is the function of the clamp blocks. The clamping surface of the clamp blocks are ground concave which leads to two initial contacting points at the outer ends of the clamp blocks and gives them the function of a leaf spring. 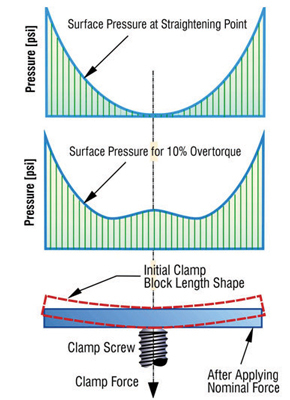 In Figure 4 it is shown how the pressure distribution between clamp blocks and blades develops when the clamp screws are tightened. At the beginning of the tightening (top in Figure 4) the pressure concentrations at the outer clamp block ends have the same function as two independent clamp screws. As the clamp block develops contact in the entire length, a constant pressure distribution base load, superimposed with 3-load concentration points will be reached at nominal clamp screw torque. One clamp screw in connection with the concave clamp block achieves the result of three screws, yet eliminates axial shifting of the blades during the cutter build operation. This clamping principle allows fast building with only one clamp screw per blade and delivers optimal conditions for cutter truing. The combination of Pentac blade seating with one screw clamping provides easy insertion and removal of blades during building and disassembly of cutter heads. The phenomena of jamming blades as found in cutters with rectangular blades is completely eliminated . The “plus” stands for a number of improvements versus the original Pentac system which can be materialized especially in connection with three and four face blade geometry. 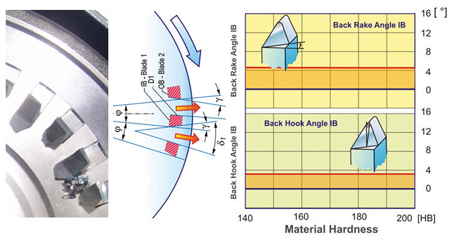 The higher cutter slot angle of 12° (Figure 5) assures a positive cutting edge hook angle and at the same time gives a back blade surface that opens the chip chamber to the following blade in order to enhance chip flow and prevent chip packing. 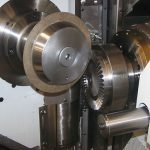 The chip flow in face milling is often not sufficient in front of the outside blades, because the side rake angle closes the chip chamber in the direction of the centrifugal force. 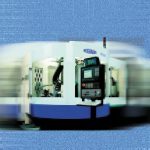 The improvements in chip flow reduce the cutter head and blade operating temperature, which in turn improves the tool life. The high slot inclination in connection with pre-raked blade blanks that use 5° instead of 12° side rake angle, make it possible to improve the tool life of 2-face ground blades by 30%. In other words, the new Pentac®Plus cutters are not only the optimal cutter solution for 3-face ground blades but also present a breakthrough in 2-face technology. 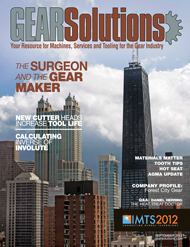 Gleason has the solution to prevent chip packing in all high-efficient dry cutting processes. The back hook angle will open up the chip chamber and, if required, additional back face grinding (fourth face) will eliminate the need for fewer blades in Pentac®Plus cutter heads in order to avoid chip packing. The beginning of a typical chip packing is shown to the left in Figure 6. The center graphic in Figure 6 indicates the closing chip gap in front of outside blades (upper chip flow arrow). Grinding of the back face in two directions, as shown in the diagram to the right in Figure 6 will open the chip gap to the outside and provide free chip flow. The front face grinding of blades for Pentac®Plus cutter heads offers the freedom of higher effective top rake angles and positive cutting edge hook angles. 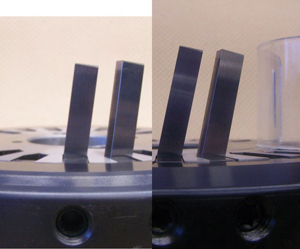 Figure 7 compares the limited top rake angle freedom of conventional cutters to the left with the increased freedom to optimize top rake angle and cutting edge inclination of Pentac®Plus to the right. The new clamp blocks use 2 to 4 spring loaded steel balls (Figure 8), which enable in a partially depressed stage a very precise axial blade movement during cutter building and truing. The new features have been developed to account for the significantly higher productivity of Multi-Face, F-Point design carbide blades. Pentac®Plus cutters are available for face hobbing as well as face milling for the sizes 3.5 inch up to 21 inch cutter diameter. The blade blanks required are identical to the blades for regular Pentac cutters. Recommended are zero raked block blades and three or multi face grinding. Cutting trials with Pentac®Plus resulted in up to 200% improvement in tool life compared to regular Pentac® cutters. The combination of the original Pentac® idea (Figure 3) and the new Pentac®Plus features with three of four face ground blades and an all around coating delivers excellent cutting performance. Productivity has increased, production stability has improved and tool life is at an all time high. The evolution of tool life, depending on cutter and blade technology is shown in Figure 9. The diagram in Figure 9 shows the side relief-wear land width versus the length of all chips removed during the tool life of one blade. The cutting length in km is an abstract value, which shows its significance in the comparison of different technologies. The alternating blade arrangement with positive rake angles of each cutting edge shows its highest advantages compared to full profile blades in connection with the new Pentac®Plus cutter system. 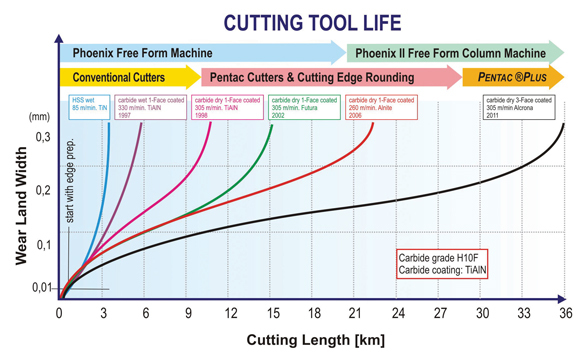 Tool life improvements due to Pentac®Plus compared to other cutting systems ranged up to 100%. A variation of the Pentac®Plus cutter system was especially designed for the requirements of aircraft bevel gear manufacturer which still use the five cut fixed setting method, yet like to convert their soft manufacturing to the latest high speed dry cutting process. Pentac®Aero cutter heads carry only outside or only inside blades. The slot radii are defined such that in combination with standard Pentac blade blanks the radii of all existing fixed setting designs as they are used in the aircraft industry can be covered without the use of parallels or shims. The number of blades in a Pentac®Aero cutter head is defined as a common multiple of 3 and 2. This will allow to use any Pentac®Aero cutter with 2, 3, 4, 6… up to 30 blades. 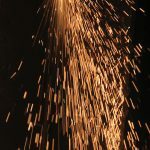 For small manufacturing quantities, the investment in blades can be kept very low, where for higher quantities a full complement of blades will provide very short cutting times and high manufacturing economics. 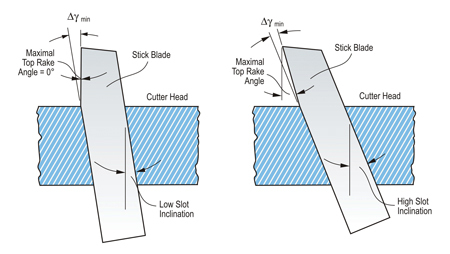 Figure 10 shows three 12inch Pentac®Aero cutter heads with different number of evenly distributed blades. The Pentac®Aero cutter head has only one kind of slot, with one slot radius. The same cutter head can be used for convex and concave cutting, depending if it is built with inside or outside blades. The blade spacing is somewhat larger than the spacing of alternating blade cutters. However, the number of blades is still about twice the number used in a Hardac® style cutter heads. 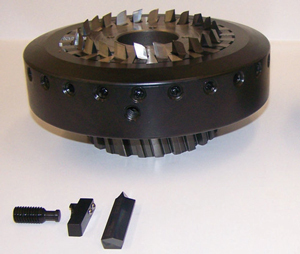 The outer diameter of a cutter head is critical in aircraft bevel gear cutting. Many aircraft fixed setting generated ring gears have a high face angle (above 80°) and require a large relative motion during the generating roll. This combination causes interference problems between the face of the blank and the face of the cutter head in particular at the outer diameter of the cutter heads. Because of the smaller overall number of blades, compared to the same size PentacPlus cutter head, it was possible to reduce the thickness of the outer ring, which carries the clamp screws and reduce the outer diameter of all Pentac®Aero cutters. An additional 12° chamfer over 60% of the width of the outer clamp ring provides additional clearance in the interference critical area. 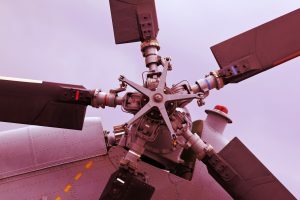 Cutter heads which include a plurality of different slot radii within one cutter body will present exaggerated interference potential and are in general of limited suitability for most aircraft applications. 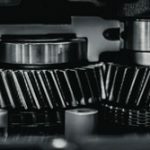 Aircraft bevel gear manufacturers mostly have a high variety of different part numbers and therefore require a large inventory of different cutter heads for rather small size batches. In order to reduce not only the number of required blades for individual jobs, but also reduce the number of required cutter heads, it is recommended to apply left hand cutter heads for left hand as well as right hand pinion or gear members. 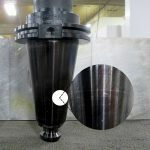 This is possible without consequences for part quality and cutting performance and will reduce cutter inventory to 50%. 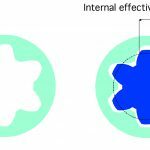 In many applications it will be possible to save the roughing operation with an alternate blade cutter previous to the finishing of the convex and concave flanks. Instead it is suggested, to use the inside finishing blades to rough roll the slots from heel to toe, followed by a small set in and a finishing roll from toe to heel. This process allows to rough out the slots and finish the convex flanks with one Pentac®Aero cutter and finish the concave flanks with the second Pentac®Aero cutter. 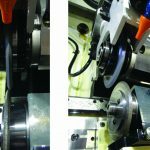 The transition from wet cutting with Hardac® style cutters and high-speed steel, front face ground blades to Pentac®Aero cutters can be adjusted to the environment of a particular manufacturer. It is possible to begin with wet cutting and pre-raked HSS Pentac blades, which have a permanent coated front face and use 2-face sharpening. A second possibility is the use of carbide Pentac blades, which are pre-raked and 2-face, sharpened. This process is possible for wet or dry cutting, depending on the available machine technology. The third possibility is the use of high productive three-face sharpened and all around coated Pentac carbide blades. Also this process is possible for wet or dry cutting. 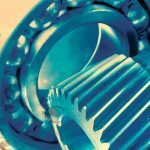 The productivity of Pentac®Aero cutters with carbide blades is in the range of 5 to 10 times higher than cutting with Hardac® cutters equipped with HSS blades, depending on the number of blades and the kind of bevel gear cutting generator. 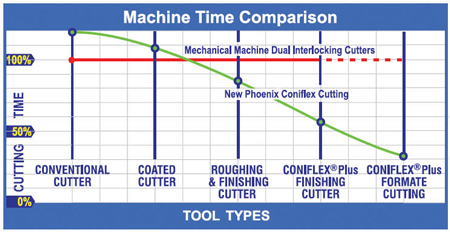 The new Coniflex®Plus cutter system is also a part of the Pentac family of cutting tools. 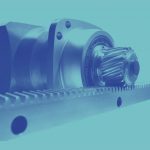 Coniflex®Plus is the world’s first peripheral stick blade cutter system with positive blade seating, developed for cutting of straight bevel gears according to the Coniflex method. 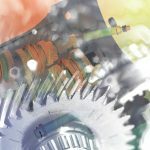 Coniflex®Plus allows the use of coated carbide blades in high-speed dry cutting of straight bevel gears. 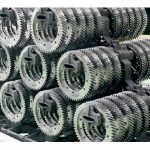 Until now, straight bevel gears had to be manufactured in a wet cutting process, using high-speed steel tools. 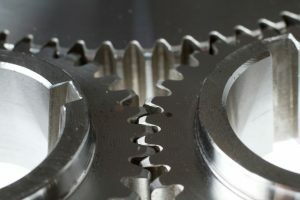 The new process is at least three times as fast as the traditional cutting, avoids the use of any cutting oils and consumes only about 25% of the electrical energy of straight bevel gear cutting, while at the same time presenting a significant leap in environmentally friendly manufacturing of straight bevel gears. 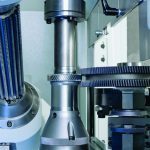 With the development of three sizes of Coniflex®Plus cutters (4.25 inch, 9 inch and 15 inch) the final step to a modern, economical straight bevel gear cutting process was concluded. Figure 11 shows the 9” version of the new cutter generation. The “iris” look of the blade ends at the inside of the peripheral cutter head achieves a higher number of blades in the cutter and preserves the blade length for a maximum number of re-sharpenings. The cycle time improvements with the high speed dry cutting process of generated and FORMATE parts is reflected in the chart in Figure 12. 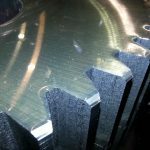 In all real cutting applications, the significant cycle time improvement went along with better part quality. The new dry cutting process also provides the option to remove the root fin in cases of small blade point or large slot width taper. For the fin removal a lateral cutter movement is performed which would not be possible with high speed steel tools because of instant blade tip degradation. The root fin removal also makes it possible to cover a wide variety of different gear designs if the smallest blade point is used for the common cutting blades without a sacrifice of root appearance and bending strength. 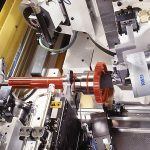 The Pentac® cutter system introduced for the first time a positive blade seating to the process of chip removal in bevel gear cutting. A further improvement was done by adding several enhancing features like higher slot inclination, clamp blocks with integrated spring loaded steel balls and solid clamp screws. The freedoms in optimizing the front face of the cutting blades was highly increased with the higher slot inclination. The higher slot inclination also forms an opening chip gap between cutter face and blade tips on the backside of each blade. Additionally, grinding the back face of the blades provides an enhanced chip flow through the chip gap between the blades, to enhance the performance of the new Pentac®Plus even more. Highly productive cutter heads require easier ways of building and truing. This has been realized with the new clamp blocks which allow movement of the blades axially, like rolling them on a roller bearing, yet provide enough friction on the prismatic seating surfaces in order to allow for precise axial positioning. The result of this development can be materialized with significantly increased tool life and higher productivity, which also is reflected in enhanced production stability. is vice president of bevel gear technology at the Gleason Corporation. Go to www.gleason.com to learn more.